Yao Ming walks off the court in the second half of the Rockets-Detroit game after bumping into Luther Head, producing a cut above his eye that required four stitches. Yao would score only 12 points on 4-of-13 shooting in 26 minutes of action. Click here for more photos from the game. After an exhilarating game against the Chicago Bulls on Saturday night, I was so looking forward to the Rockets game against the Pistons Sunday night. Would the Rockets show they have turned the corner and play an inspiring game against one of the league’s best teams? Or would they melt under the pressure? After the Rockets took a step forward Saturday, they took another step backward Sunday, losing 94-82 at The Palace in Auburn Hills. The game wasn’t as close as the final score would seem to indicate. It’s easy for the national headlines to blame the loss on the Rockets losing Tracy McGrady to injury in the game (more on that later), but the Rockets have shown they can be very competitive without him. The Rockets still had a chance to win this game, but for some stupid reason Rick Idle-man didn’t play Aaron Brooks when he should have. Has this coach learned anything about his players yet? Why does it always take him about 3 times longer than everyone else to figure out who should be playing? Brooks had been a key to the victory in Chicago, but rather than put him in the game when the Rockets still had a chance in the third quarter, he had Luther Head and Rafer Alston in there, and they were just ‘okay.’ When you play the Pistons, winners of 11 of their past 13 games and one of the hottest teams going, just putting your ‘okay’ players in the game — and playing them the entire quarter as the game slipped away — isn’t going to cut it. At the start of the third, the Rockets were down only 51-44. But things started falling apart when Alston let a pass from Shane Battier slip through his hands, resulting in a steal by Rip Hamilton that led to a layup the other way, capping a 4-1 run by the Pistons to make it 55-45. Shortly thereafter, McGrady – who wasn’t all that bad with 14 points on 6-of-10 shooting — headed to the locker room after re-aggravating his sore left knee, and wouldn’t return. I wasn’t devasted by his departure. Remember, his absence in the Denver game resulted in the Rockets moving the ball better than when he’s in the line-up, and provoked Magic Johnson to utter the “trade” word. Alston would atone for his turnover somewhat by hitting a three-pointer, and Luther followed up with a three of his own to cut the deficit down to 57-51. But that’s when the wheels started to come off. Alston would turn the ball over again, would then miss a 3-pointer, followed by Battier missing a 3-pointer, and Yao missing a turnaround jumper. Meanwhile, the Pistons went on a 6-0 run to put the game in peril for the Rockets, who were suddenly down 63-51. Then for some unexplainable reason, Chuck Hayes throws up a crazy hook shot (what is he doing shooting one of those? ), and about a minute later Hayes was faked out of his jock by Antonio McDyess on the baseline. Hayes fouled him, and McDyess went to the line and hit 2 free throws to make it 67-53, Detroit. By then, it was too much to overcome, and it was all downhill from there. 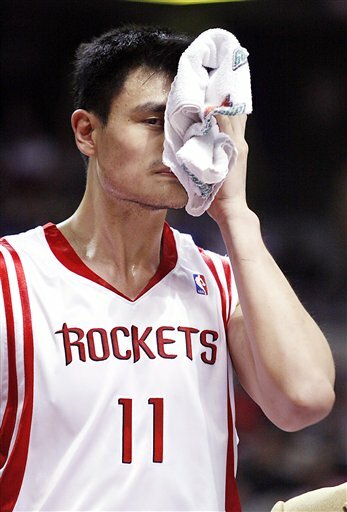 Yao got cut over the eye and had to go to the locker room, but don’t believe for one minute his absence from the game was the reason why the Rockets lost this game. Bad plays both offensively and defensively did them in. For example, probably the worst defense I have ever seen by one player in two consecutive possessions occurred when Luis Scola (one of my favorite players, BTW) decided to guard an empty space on the court, leaving McDyess wide open to cut to the basket for a dunk. Then on the next play for the Pistons, McDyess cut to the basket leaving Scola way behind, resulting in an easy pass to McDyess for a layup. That made the score 73-56, energized the Detroit crowd, and it was garbage time from there. As skilled as Scola is offensively and hustles for rebounds, this isn’t the first time he has had major problems with defensive breakdowns. I’ll cut him some slack because of the transition he is making from the Spanish league, but the last time I checked, leaving guys wide open overseas can also burn you defensively. Unfortunately, these mistakes by Scola give Chuck Hayes the kind of starting job security he shouldn’t be having. Scola would score 12 points in the fourth quarter on 5-of-6 shooting, but it was a quarter that didn’t have any meaning. I couldn’t wait to see it end. Idle-man would eventually put Brooks in the game at the start of the fourth quarter, but he had already missed his chance to have him do some damage while the game was still in the balance. Yao would return to the bench in the fourth quarter, but there was no sense in putting him in the game because it was already over. As a result, Yao didn’t have an opportunity to finish strong to make his stat sheet look more respectable. After starting the game 1-for-7 from the field, he finished 4-of-13 from the floor to score 12 points in 26 minutes, had 5 rebounds and 7 turnovers. Ouch. Yao’s poor shooting was pretty consistent with what the Detroit TV crew posted on the screen during the game. I forget what range of games they were showing this stat for, but Yao shoots only 38.5% from the field on the second night of a back-to-back. In that pivotal third quarter, you also have to look at the stat sheet and point at Luther Head’s bout with McGrady-itis disease where he jacked up 5 three-pointers (he made two of them). But that’s way too much of your offense when Head’s 5 treys (and 7 shots overall) make up that much of your team’s 17 team shots in the quarter. But that may have been a result of Idle-man putting other players in the game who have a hard time scoring at times. Again, Brooks should have been in there. The Rockets also got nothing from Bonzi Wells, who was 0-for-4 in 14 minutes, including an airball 3-pointer that had Rasheed Wallace razzing him from the bench. Bonzi had played well over his past 3 games, but without him making a contribution, the Rockets had no chance. I like how Wallace stirs the pot. I think every team could use a little bit of that ‘bad boy’ attitude to get his teammates pumped up, like the statement he made before this game saying there was no way the Rockets were going to beat them again. He said it, and they walked the talk. The Rockets don’t have that, and I think they could use a little of that. As much as I want to blame this game on ineptitude by the Rockets’ bad offense and defense, the Pistons are in a different class. Over their 11-2 record since November 28th, Detroit has held their opponents to 43% shooting from the field and 85.9 points per game. Houston fell short of those marks (40% shooting). But at least it confirmed the Rockets are nowhere close to being a team like the Pistons, who will probably be playing in the Eastern Conference Finals against the Celtics next May. So now the Rockets have almost 5 days off during the Christmas break and are looking at a mediocre 13-15 record. If any relevant news occurs over the next few days, I’ll post it here. But chances are there will be no significant player moves that occur over the holiday. Even GMs take some time off, and I don’t think a lot of them want to get a bad rap for being heartless in trading a player during a holiday when they’re enjoying time with their families. For better or worse, it’s not ‘politically correct’ to do that. But hopefully the next few days we’ll all get to clear our heads of the disappointment the past two months have brought to Rocket and Yao fans, and the players will come back energized next Friday against Memphis with renewed vigor and optimism toward salvaging this season of disappointment. This entry was posted on Sunday, December 23rd, 2007 at 11:59 pm	and is filed under vs. Detroit. You can follow any responses to this entry through the RSS 2.0 feed. ……When It Rains It Pours……. What’s with all these talks about Tracy for Gordon and Big Ben. I would like that, but I think the Bulls are getting the short end of that deal. The Bulls have fired their Head Coach. That approach is scientific and logical. If the had coach is not responsible for poor results, who should be the guy? But look at the Rockets. They are right now the most disappointing team in NBA.But they are still celebrating that they have got a great coach. They think that the disappointment is not due to the decisions of the head coach. Fine. I suggest that Idleman’s contract be extended to 10 years. How about that? After giving Skiles a lump of coal in his stocking when he passed over Chicago, maybe Santa will give Idle-man the same present tonight in Houston. It was fun reading your articles all year. I was a little surprised by Skiles’ firing, but firing a coach during the Christmas break does have its benefit. Since so few games are played, it allows the new coach time to get prepared for the next game. I’m glad you have enjoyed my articles, K.
so who should be the rockets coach since you are no fan of “Idelman”? I don’t think they will fire him for awhile. He’s too new. If they do, I have no idea. It could be someone like Larry Brown since Les Alexander and Larry know each other fairly well (I believe) since they are both New Yorkers. Or it could be a young coach like Mario as they look to rebuild (trading McGrady could be another rebuilding type deal). Nobody, including Yao, has been playing well under Rick Idle-man’s new regime. Yao put up more mins per game yet his production is down. Currently he is shooting under 50%. The offense is sputtering and the defense is no where near what it was last year. There is a small chance that they can turn it around. Give this team 10 more games and we can see if they will make it to the postseason or not. Right now every team above the Rox is a good team. It will be awfully difficult for the Rox to catch up with them with the way they have been playing. Hey John, I had gotten these from David Thorpe over their @ ESPN. I think he is on the same boat as you. • Every time I focus on Scola, he leaves me wondering why he does not get more playing time. He seems to have an antidote for a team currently 22nd in offensive efficiency. He can shoot, post up and create his own shot — with crafty moves and superb timing on his counter-spin (both off the dribble and on the blocks). • Another Rockets rook who’s looking to get more time is diminutive point guard Aaron Brooks. He provided a valuable spark in Houston’s win over Chicago with six assists, and followed that up with a solid 12 points on six shots in Detroit. His small stature helps him on offense, where his quickness and change-of-speed dribble make him a tough guy to stay in front of. And he’s a better finisher at the rim than you’d think. I had the same thought as David T. on Scola. Even though Scola looks lost at times this year, but I think that could be attributed to the coaching because he must have some skills to win the Spanish League MVP 2 times. He also has shown that he can scored in the NBA as illustrated from three games in which he scored 20 points this year. I don’t understand why the coach doesn’t play him more or start him. It can’t be any worse than their current starting power forward whose free throw percentage is 27%. NBA is the best league in the world, I just can’t imagine for a starting player or any player to shoot 27% FT. Isn’t the Rockets’ coaching responsibility to help him to change his shooting motion? Do you want to know the answer to your questions? It is all because of the guy who makes the final decisions of the Rockets. And this guy is sthe Head Coach. And the name of this guy is Rick Disaster Idleman. And the management of the Rockets is of the opinion that he is a great coach. And the management wants to keep him at the expense of the players and the FANS. So, what can the FANS do? Forget about the Rockets until the Disaster is gone.